The beautiful Ray Mears Leather Knife Sheath has been hand-made from start to finish, and the finished article truly reflects the workmanship that has gone into it. This particular model features an integrated loop, allowing you to safely carry your knife on your belt. 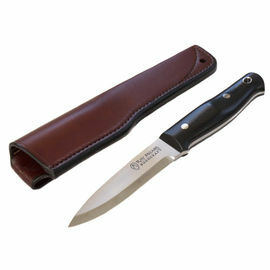 This sheath is a durable, high-quality product which is sure to keep your knife protected and safely concealed. Many knife sheaths may look similar on the outside, but what makes a sheath do the job safely and securely is what is on the inside: it must fit the knife in all particulars to prevent movement by allowing the blade to bed slightly into the welt and also provide a fit in the handle section while still allowing the knife to be smoothly withdrawn. 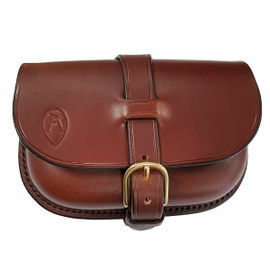 All of our leather goods are hand-made in England by a craftswoman with over two decades of experience. All leathers are vegetable tanned with full, natural grain, and are hand-dyed in house to the unique Woodlore colour. All of our knife sheaths are treated to harden them and provide a penetrating wax finish. Please note that this sheath will not fit the WK1 Woodlore Knife made by Alan Wood. If you wish to purchase a sheath for this knife, please contact us for further details. Will this sheath fit my knife? 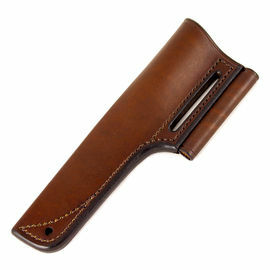 Ray Mears Leather Knife Sheath - Belt is rated 5/5 based on 14 customer reviews. What can I say other than you cannot wear them out and nothing fits your Woodlore or RM bushcraft knife like these custom sheaths designed for it. For the forth time, a product top quality. I recommend for anyone who wants quality. Thank you for that, greetings, Belgium. A fantastic high quality piece of kit. 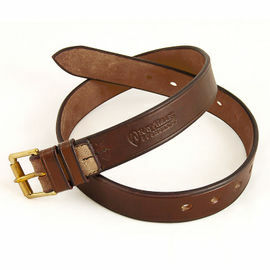 The leather used is of a very good quality and the workmanship is second to none. I would highly recommend this item to anyone looking to replace a lesser quality item for a top end one. I purchased to replace a sheath supplied with A Wright & Sons Bushcraft Knife which it knocks into a cocked hat! I didn't trust any equivalent product online for the money and glad of it too. It's quite apparent Mr Mears won't associate his name with anything but the best quality that budgets will allow. Superb craftswomanship with a thick and sturdy welt (way more stitching than my original) that clutches and beds the knife; whereas it would sink to the bottom of my old one, eventually splitting the stitching. And you guys are the gold standard when it comes to delivery. Looking forward to shopping here again as my bushcrafting pursuits evolve. Fast delivery, excellent quality. I would recommend this to my friends. The Leather is very thick and stiff. It will take good care of the knife inside. Superb bit of kit and very fast delivery. Highly impressed with the quality so will be ordering more kit cheers. Please pass on my complements to the leather department. Many thanks to all. Cheers, Nick. Exceptionally well made sheath, lovely bit of leather. Fine quality knife sheath. Fits several of my favorite customs like a glove. Great service too. Can I use a Ray Mears Leather Knife Sheath for different knife? We recommend that you do not use any knife sheath for anything other than the knife for which it is specified. The inside parts of a knife sheath are carefully shaped to support and fit both the handle and the blade, preventing movement and therefore preventing cutting. If any part of the inside of the knife sheath does not fit correctly to the blade or handle there is the possibility of unwanted movement which will potentially destroy the sheath and could be dangerous. The Ray Mears Leather Knife Sheaths are made to fit the Bushcraft Knife that is currently available on the website and the Wilkinson Sword and Julius Pettersson knives that have been available previously. They should not be used for any other knife. Can I ‘wet-mould’ my Ray Mears Leather Knife Sheath? Whilst wet-moulding a leather knife sheath is a reliable way of achieving a very good fit between knife and sheath we recommend that you do not do this with your Ray Mears Leather Knife Sheath and it is not necessary. Our knife sheaths have been finished with a hardening process that involves the application of a penetrating wax finish; both the effects of the hardening process and the finish will be destroyed by wet-moulding. 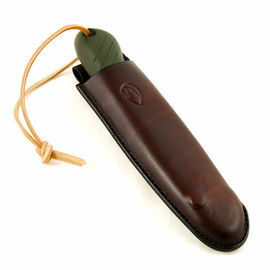 The Ray Mears Leather Knife Sheath knife is intended for use only with the Bushcraft Knife that is currently available on the Woodlore website and the Wilkinson Sword and Julius Pettersson knives that have been available previously and should fit perfectly without need for wet-moulding. Some easing and ‘bedding-in’ of the knife and sheath will occur with use but no further intervention should be necessary.